Kijoma Solutions Ltd - Wireless Internet and Telephone service provider : Kijoma Broadband : No BT, No Satellites, Just fast Internet and Telephone ! There is a lot of hype about the tax payer sponsored roll out of "Fibre" services at the moment and I am sure they can do quite a lot with a £1.2Bn+ benefit cheque. Ultimately though the technology used falls down in many situations. The speed depends on the length and quality of your phone line in the same way as the old ADSL Broadband did. Just with much shorter distances of typically 1km or less to the cabinet. 2- No reliance on phone line technology. Our customers do not need a phone line or to pay £19+ a month for the privilege of having one on top of their Broadband fee. 3 - Kijoma supports VoIP, (Internet Telephone) We use this exclusively for our business and so do many of our customers, including schools and businesses. The cost saving over fixed lines is considerable and the benefits increase exponentially with additional lines and services, all without installation costs and more line rentals. 4 - Kijoma link directly to the backbone of the Internet via such Providers as LEVEL 3, a multinational Tier 1 (top level) Provider. There are no restrictive exchanges or multi middle men. Unlike other Providers who rely on phone lines, we own our Network and maintain it ourselves. We are not just some 'parasitic' reseller. 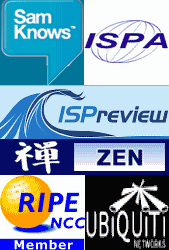 6 - Kijoma do not filter or otherwise restrict different Network protocols or services. Our usage allowances are clear, not obfuscated in the small print like many "unlimited" services.